A thirteenth-century iconic structure of beauty now a shell of skeletal remains. This unfolding news is one of which, where an entire world comes together to pray. The history of “Our Lady” has been with us for over 800 years. Let us believe and hope that Notre-Dame Cathedral can be rebuilt to her natural beauty. Surely it can be rebuilt, but it will never be the same again. Such a huge loss this is. I had to turn off the news, just to sad to watch. I always dreamt of going there one day. This truly hurts. 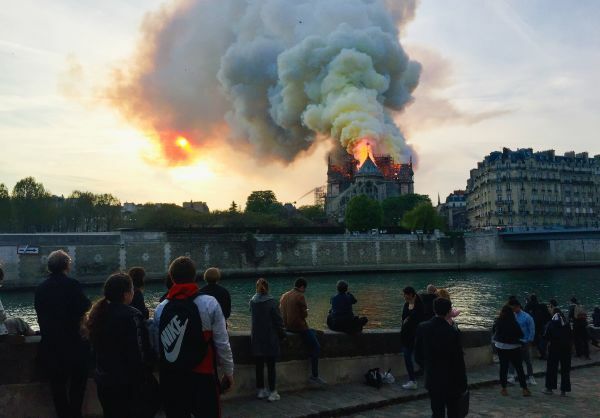 The irony of the Cathedral surviving the French Revolution and both World Wars, to succumb to flames as a part of it was being renovated is maddening. I know. This is so shocking and saddening. I hadn’t heard about this. How awful! I visited Notre Dame once and it was really amazing. I have always wanted to see Notre Dame if I were ever in Paris. This broke my herat when i saw this on CNN. It is a sad affair. I just got done watching the news, and it’s so heartbreaking. I was watching channel 7 news, and they were speaking about how the NYFD installed a state of the art water/chemical system in St. Peters Cathedral in Manhattan. They realized they couldn’t just hook up a regular sprinkler system because it would have destroyed the integrity of the structure itself. 😢 Couldn’t agree with you more.